There is no doubt that tick prevention is your only way of keeping your family and your pets healthy and away from tick-borne illnesses. However, the means of doing it should be effective but safe. You don’t just take medications unless you are sure they’re safe, right? By all means, practice the same carefulness about safety when trying to keep ticks off your pets, you or your loved ones. Whether you own dogs or not, you most likely have already come upon ticks and are familiar with how they look like. Likely too that you already know they are blood-suckers that can grow up to 5 times their original size as they become engorged even in just a single feeding. Why the importance of tick prevention then? What you may not know is that a female tick is capable of laying thousands of eggs that can become new batch of ticks – transporters of deadly diseases. Keep ticks off your pets by regular thorough inspection even if it means you are only looking for a single tick. This lone tick could be carrying eggs that would eventually become thousands of tiny vampires in no time. Go through your pets’ fur on a constant basis; better still, consider regular shearing if your pet grows too much hair. It can be difficult to look for ticks with so much hair in the way. Ask your vet about pet shampoos that work as good tick prevention, something that has a stronger formula but be sure to carefully follow instructions about its use. Ticks are mostly found in bushy areas. Try not to let your dogs or cats stray to these areas and carry the blood suckers back to your property. Keep ticks off your yard with USDA approved anti-tick products that you can spray on your plants, grass and even on piles of dirt, wood or leaves. The Centers for Disease Control and Prevention may also be a source of information regarding tick-proofing your landscape. A well-maintained lawn is another ideal but effective tick prevention step. Make it a point to regularly clear your walkways or patios of fallen leaves and mow your grass short. 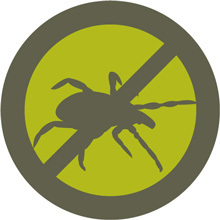 Let as much sunlight to avoid dampness in selected areas that can become a haven for ticks. Birds make good host for ticks so you might want to keep them away during tick season. Keep birdhouses, birdbaths and birdfeeders in storage for the meantime. Taking some precautions will help keep ticks away and reduce the risks of being bitten. There may be times when the pesky critters seem to have dwindled in number especially after summer is over but that is no reason to put your guard down. Ticks may still lurk somewhere in your home biding their time. Needless to say, yes, they can be a year-long threat. They may make it seem like they’re gone but gifted with some weird sense to detect a prey even at a distance of 18 feet, ticks would slowly emerge from somewhere and find their way to you or your pets. Make sure you win the battle against ticks by making it harder for them to prey on you or your loved ones including your pets. Never let not even a single tick climb its ways to you by wearing your pants with the legs tucked into your socks when going to areas where ticks are present. It also helps to spot ticks easily if you wear light colored clothes. Spray your shoes, socks and pant cuffs with tick repellents as an added tick prevention measure. Dogs run loose for that much needed exercise but don’t let your pet venture where there is high grass and brush to minimize the risk of ticks attaching to it. You may be doing your best to keep ticks at bay in your yard and immediate surrounding but your dog could be the reason for tick invasion. If you allow your dog its regular run, be prudent about checking for any signs of the sneaky invaders. Consult your vet for products that are safe to use on dogs if you must use any repellent on them as tick prevention. Should you find a tick anywhere in your home or worse attached to you, to any family member or pets, don’t hit the panic button right away. It takes some time for a tick to transmit diseases; the least is 24 hours of continued feeding from its host. Immediately remove an attached tick with a pair of tweezers by grasping the head and as close to the skin as you can before pulling steadily and straight out – no twisting, no tagging and most certainly no squeezing so that no body part remains buried and no bacteria-carrying saliva is injected in the skin.